New tools THGE and CRETAC for generating artificial accelerogram from a response spectrum and for creating time history files compatible with PIPESTRESS. Graphical user interfaces for the programs FHFILE, SPECT, THIST and ASG. Time history input files (tac and thf) can be modified directly. Option to open the report files with an external text editor. Modal masses added to the frequency table in the stress report generator. Show local axes for a given element or for all elements. Better display of non-linear supports. New data list for end conditions (weld and taper options). Supports parallel to the pipe can be shifted. New table to show the stress indices from PIPESTRESS reports with color visualization. New split color option for stress ratio and stress indices. Improved filter: the filter can be modified from the data lists and the tree view. Animate the piping displacements for a time history case by loading the pop file created with THIST. New custom editors for TITL (fre file) and OPTN (POSTR file). Improved division tool: nodes may be inserted at a given distance from the start or end node of an element. New Code Editions up to 2017. New FDIS card (Force DIStributed): this new card allows to apply uniform or trapezoidal loads to any member. Time History Calculations with applied rotational movements (RACC analysis). Improvements to stratification features: new STRG card and extension of STRX card to bend elements. Improvements to nonlinear restraints NRST: allow RMVT cards and consider friction effects. Improvements to floor response spectrum analysis RCAS: implementation of Gupta and Lindley-Yow methods for both periodic and rigid modes and implementation of counterphase interlevel LV=6. New program ASG (Amplified Spectrum Generator): generation of amplified spectrum at the decoupling point between run piping and branch piping. Improvements to beam elements BEAM: nonprismatic beams, calculations of section properties based on beam geometry, automatic mass point generation enabled for beams and new PF field for definition of start point. New NTSP and NRSP cards (nonlinear springs): nonlinear translational and rotational springs. Implementation of new equations for functional capability and operability in RCC-M Class 1 and Class 2: new equations EQ=S, O and P when the RCC-M code is selected (IDEN CD=7 or CD=8). 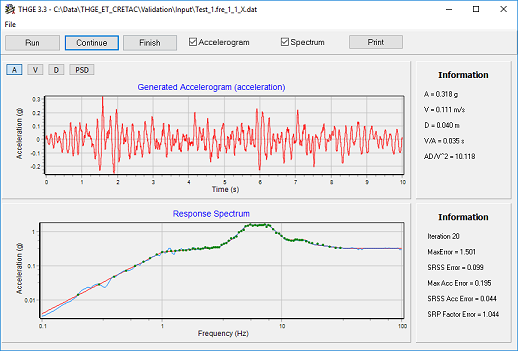 Additional information for multilevel floor response spectrum analysis (RCAS card): the modal masses for each mode and each direction are now printed in the prd file. New branch option BR in the TITL card: this new option governs how the flexibility of non-Class 1 branches is calculated. Implementation of Time History analysis with gapped restraints (ADAMOS): new analysis cards PCAS and PACC. Dynamic analysis of piping systems with gapped restraints is based upon a piecewise linear approach in which the total response is obtained as a summation of all the modal responses and a correction for the left-out modes (beyond the cut-off frequency of the system). Piecewise linear means that at time of impact or release of a gapped restraint, the mode shapes and modal amplitudes are recomputed. Between impacts or releases the system behaves linearly. This method, called “ADAptive MOdal Summation” (ADAMOS), can be used with applied force time-history loads at discrete points, or with floor motion at a number of support levels. Possibility to define more than 99 levels: the possible level ident codes for supports have been changed from I2 (integer from 1 to 99) to A2 (2 alphanumeric characters). This raises the available number of ident codes from 99 to 3843. Enhancements to INDI and INDB card. Possibility to consider the Bourdon effects IP=1 in the TITL card for Class 1 calculations. Possibility to select the range method ME=9 in the CCAS card for Class 1 calculations. Correction of Errors and Implementation of Minor Enhancements to QA programs POSTR, FHFILE, THIST, COMPPS, SPECT. POSTR: transfer of the options from the command file to the control file, enhancements to flange calculations (e.g. new summary for flange calculations) and minor corrections. THIST: rotational levels, implementation of dynamic analysis with gapped restraints (ADAMOS). FHFILE: rotational levels, integrate feature. COMPPS: possibility to apply specific options to each comparison. PIPESTRESS is now available in 32 bits and 64 bits version. Possibilité de modéliser les sections non prismatiques (inertie variable). Calculs exacts de la matrice de raideur et de la répartition des charges par intégration numérique. Correction bug BS-65 (masses modales non prises en compte si affectées sur degrés de liberté bloqués et converties en charges nodales) . Hexagon PPM is the leading global provider of engineering software for the design, construction and operation of plants, ships and offshore facilities. The analysis solutions currently offered through Hexagon PPM’s CADWorx® & Analysis Solutions business provides powerful, yet scalable, solutions to thousands of global companies of all sizes. DST's customers will benefit from Hexagon PPM’s strength and stability and its global product development and support capabilities. For more details, please view the Hexagon PPM news release here.